There has always been a dearth of good investigative movies in the Hindi film industry. After a long the return of Meghna Gulzar with her new film Talvar this genre is given a serious thought and execution. All of us are aware of the double murder case of 2008 in NOIDA. The case did raise a lot of questions and just like the latest Sheena Murder Case received a lot of media hype and attention. 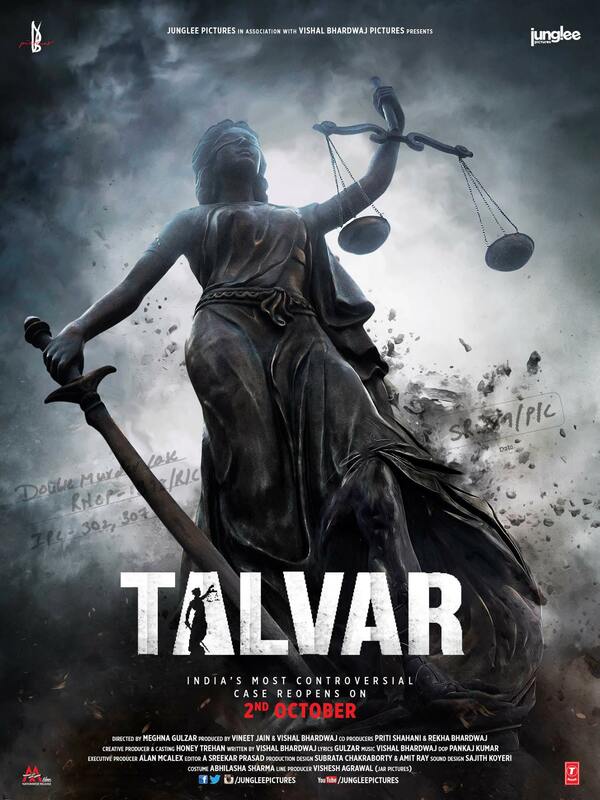 Talvar is based on the same Aarushi-Hemraj Murder case. The story as we all know is about the teenage girl who is found dead in a house where she lives with her parents. The missing servant is suspected of the crime until his body is also found in the same building. There are only parents who were in the house at the time and they become the prime accused. We might think that we know everything about the case as it was covered heavily by the television channels in the past seven to eight years, but this film takes you inside of the investigation procedure where you don’t have a clue what happens. How media manipulates and where every piece of news is just a commodity to be sold to as many eyeballs as can be. The Talvar of the Figure of Justice is the Police that handles the investigation and if that is weak the Justice system can really not do much. It is believed that Vishal Bhardwaj who is the writer as well as producer of the film did meet with Aarushi’s parents and got their account about the whole case. The film does not give a conclusion about the case but it definitely gives you an honest opinion, rather three perspectives of the complete incident. Even when all the proceedings in the film are true to life it is yet not at all dull at any point in time. The only thing that looks filmy in the film is the strained relationship of Irrfan and Tabu. Meghna Gulzar’s effective direction keeps the film grounded and real, gritty and completely natural at all the time. With support from her exceptional list of actors including Irrfan, Konkona, Sohum, Neeraj Kabi, and Gajraj Rao the film never really feels like a film but a real account of life. There is a reference to Akira Kurosawa’s 12 Angry Men kind of discussion towards the climax. The dialogues are very witty and razor sharp, the background score by Vishal does bring out the emotions of every scene. Overall this is a must watch. Decently promoted this film might not have taken a huge opening but the word of mouth will surely help this one.